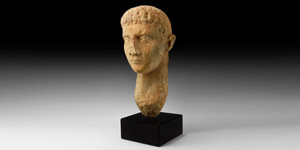 A life-size marble portrait head of a nobleman with finely modelled features, thin lips, simply carved almond-shaped eyes, defined brow and slightly pointed jawline; thick short hair swept forward to the forehead, weathered to the back; long neck, unshaped to the bottom, for insertion into a statue body; provincial workmanship, veined marble, covered in a light orange-brown patina and mounted on a custom-made stand. 24 kg total, 49cm including stand, head: 41cm (19 1/4"). Fine condition. Property of a European gentleman living in the UK; formerly in a private collection formed in the 1990s; supplied with geologic report No. TL005202, by geologic consultant Dr R. L. Bonewitz.